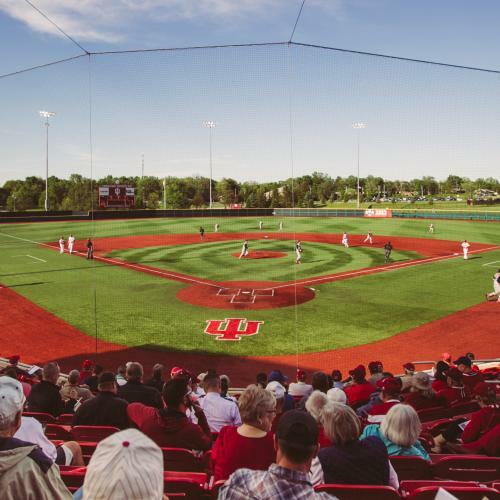 The site of all IU home baseball games, Bart Kaufman Field was completed in 2013. The new site includes a clubhouse featuring players locker room, coaches locker room, training area and team room. As well as dugouts and warm-up areas, indoor and outdoor hitting cages, new turf field, press box to accommodation for 15 media stations and radio announcers, a new scoreboard, new stadium lighting, new PA/sound system, bench and stadium chair seating, ample parking, entry plaza, picnic area, concessions and restrooms. The stadium seats 2,500 fans.